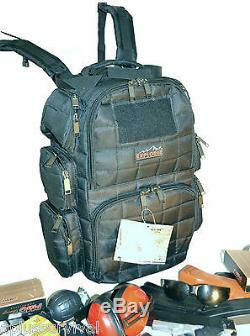 EXPLORER Tactical Range Backpack Explorer Heavy Duty Tactical Range Backpack has dimensions of: 19" x 16" x 9 This Range Backpack is strong enough to carry up to 10 pistols and plenty of magazine clips. It is made of Heavy duty polyester 1200 D It has two main padded zippered compartment (11" x 8" x 9" and 9" x 9.5" x 9") with removable dividers where you can put your hand guns individually separated one from another. It also has five zippered side pockets on the sides One 6.5" x 6" x 2" pocket with 6 mag pouches and One 6" x 5" x 2" pockets with 6 elastic mag holders. 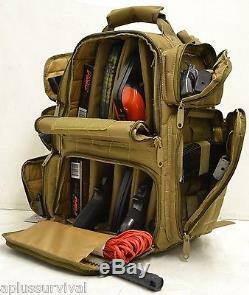 This versatile backpack offers an innovative, unexpected way to protect and transport your shooting equipment. Opening a side flap reveals 5 internal handgun and magazine storage room housed in their own rigid, lockable compartment. 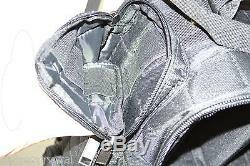 Zippered exterior pockets handle additional gear, while the customizable section on top is ideally suited to support A LOT of stacked ammo, thanks to the packs rigid, internal frame. Constructed of 600 Denier H. Nylon material, the Free Range Pistol Backpack is made with double thickness thread. Elastic loops conveniently store rolled targets, and a pull-out rain cover is there to protect your property in sudden downpours. Colors: Black, Coyote Od Green Wider backpack straps Back side laptop compartment added Thick wood board added at bottom Super large compartment added at the right hand side Target holder added at back Two extra elastic at back added for holding small gear Extra compartment at the lower pocket lid This tactical RANGE pack is built to exacting standards using heavy-duty PADDED nylon material, reinforced double-stitched nylon seaming, molded nylon buckles, and heavy duty coil zippers 3 external pockets at left, a large rear water hydration bladder pocket, and 2 spacious main compartment provide maximum storage room for all your gear The main compartment is exceptionally roomy, featuring both a Velcro around top and bottom for top and bottom for both main compartment Both outside pockets features 6 clips holder in each These 6 pockets contains an integrated nylon + elastic organizer for pens, a day planner, a digital device, protection/sun glass, screw driver tool, and gun cleaning kit Padded shoulder straps, adjustable and can be hidden inside the cover small inside pocket A reinforced carry handle is sewn to the top of the pack for your convenience Reinforced double-stitched nylon seaming for long-lasting durability Heavy duty coil zippers The top-mounted compression straps for managing weight and load stability Soft, padded shoulder straps are fully adjustable 2 D-rings for mounting accessories All zippers are double puller for easy opening and closing, the main top and bottom compartment are with lockable metal circle for your locks. 4 rubber square support at bottom All padded Designed for years of use in demanding environments, our Free Range Pistol Backpack is built to handle life on the range? If you are headed to the range, youll want to have our EXPLORER Range Backpack at your side. 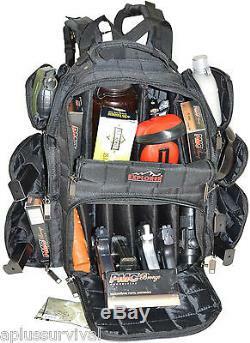 This is the ultimate in design for carrying multiple pistols to the range with all the necessary accessories and tools. 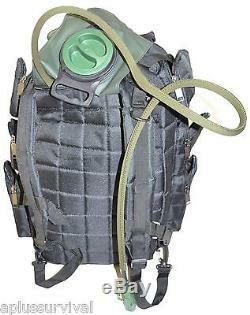 This Tactical Range Backpack really gives you the ultimate in a range bag. This Range Ready bag was designed with input from range instructors, special operations officers, patrol officers and SWAT to give you what you need when you head out for a day on the range. 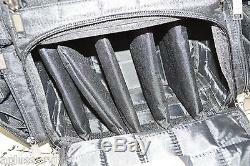 This range bag can handle any type of range activity. There is plenty of room for hearing protection, ammo, magazines, pistols, cleaning supplies and tools. Durability is the name of the game with this bag. We used only quality zippers in our Range Backpack and weve triple stitched our handles to bear the weight of the ammo, pistols and all associated gear. This bag has tough material and zippers, stitching is excellent and everything is padded for top notch protection of your guns with lots of room. 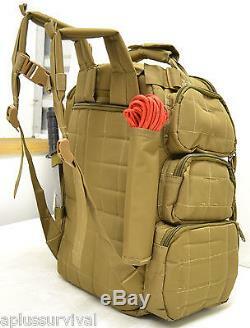 This bag is high quality in its construction and holds up to some rough use, enough to use as a daily gear duty bag. The item "Black Explorer Tactical Range Backpack Gun Pistol Survival Emergency Kit" is in sale since Wednesday, April 20, 2016. 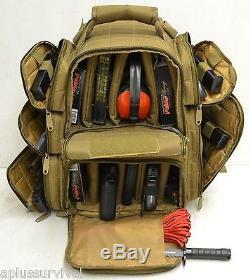 This item is in the category "Sporting Goods\Hunting\Tactical & Duty Gear\Tactical Bags & Packs". The seller is "aplussurvival" and is located in Middleton, Idaho. This item can be shipped to United States.